Nurturing Professional for Global Careers - The Asia Pacific University of Technology & Innovation (APU) is amongst Malaysia's Premier Private Universities, and is where a unique fusion of technology, innovation and creativity works effectively towards preparing professional graduates for significant roles in business and society globally. APU has earned an enviable reputation as an award-winning University through its achievements in winning a host of prestigious awards at international and international levels. QS Stars is a international rating system which allows students to better understand an institution's qualities, looking at everything from the employability of graduates, to sports facilities and community engagement. 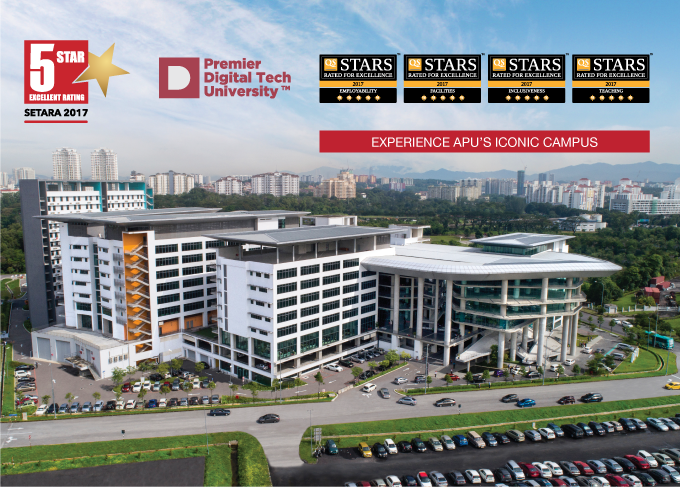 APU was awarded the Premier Digital Tech University status by the Malaysia Digital Economy Corporation (MDEC). APU is recognised for its commitment in offering top-notch digital technology courses and ensuring our highly-skilled graduates continue to flourish and fill future digital job demands locally and globally. Premier Digital Tech University status was awarded by the Minister of Higher Education Malaysia, YB Datuk Seri Idris Jusoh. 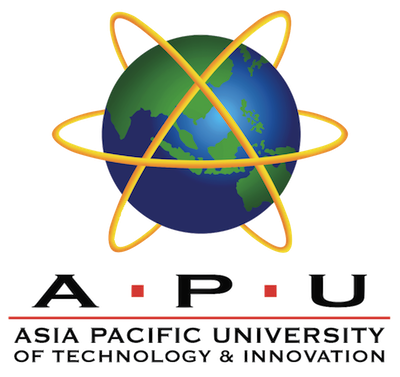 Originally established as the Asia Pacific Institute of Information Technology (APIIT) in 1993 and Asia Pacific University College of Technology & Innovation (UCTI) in 2004, APU's sound approach to nurturing school leavers into qualified professionals has resulted in our graduates being highly sought after by employers. With an international student community of more than 11,000 students from more than 110 countries studying in its Malaysian campus, APU offers a truly cosmopolitan learning environment which prepares students well for the global challenges which lie ahead. APU offers a wide range of degrees with Technology as a common core. It is APU's aim to nurture and encourage innovation through our programmes, with the intention of producing individuals who will learn, adapt and think differently in new and better ways. APU's achievements bear testimony to our commitment to excellence in higher education and training, as well as innovative research and development and commercialization. APU is certified to the internationally recognised ISO9001:2008 standards by SIRIM QAS International. The Scope of the certification covers core and support procedures and processes in the provision of programmes and services for undergraduate and postgraduate levels. Besides, being awarded the MSC Malaysia status for Institutions of Higher Learning is a recognition and testimony of APU's contribution to Malaysia's Digital Economy through IT professionals with industry relevant and immediately employable skills upon graduation. In 2017, APU is also recognized as one of the Premier Digital Institute of Higher Learning (IHL) by the Malaysia Digital Economy Corporation (MDEC), in which the university is now open to more opportunities from the government and the industry through exclusive collaborations, internship and job placements etc. Through our network of APIIT Education Group branch campuses established in Sri Lanka and India, APU also reaches out to young aspiring professionals in these countries, providing them with a unique opportunity of experiencing international best practices in higher education using curricula, processes, resources and systems which have been developed in Malaysia. APU's academic programmes are approved by the Ministry of Education of Malaysia and the qualifications are accredited, or provisionally accredited by the Malaysian Qualifications Agency (MQA). Sathyabama Institute of Science and Technology with the holy blessings of founder chancellor Colonel Dr. JEPPIAAR, and under the guidance of Tmt. Dr. Remibai Jeppiaar, Chancellor, has been strengthening its developmental activities in bearing fruits of research for betterment of the society. The architects of tomorrow and believers of today’s transformation in education; our President Dr. Marie Johnson and Pro Chancellor Dr. Mariazeena Johnson providing the necessary thrust in all the development activities of the University. Dr. S. Sundar Manoharan, Vice Chancellor, Dr. S. S. Rau, Registrar, Dr. T. Sasipraba, Pro Vice Chancellor, Dr. S. Igni sabasti prabu, Controller of Examinations and Dr. B. Thayumanavan, Dean (Dental College and Hospital) are providing the necessary support system for the best endeavours. Untiring efforts staff, students and management and positive academic ambience prevailed in the campus had made University to be ranked as 2nd among Private Universities in Tamilnadu by National Institutional Ranking Framework, Ministry of Human Resource Development, Government of India. 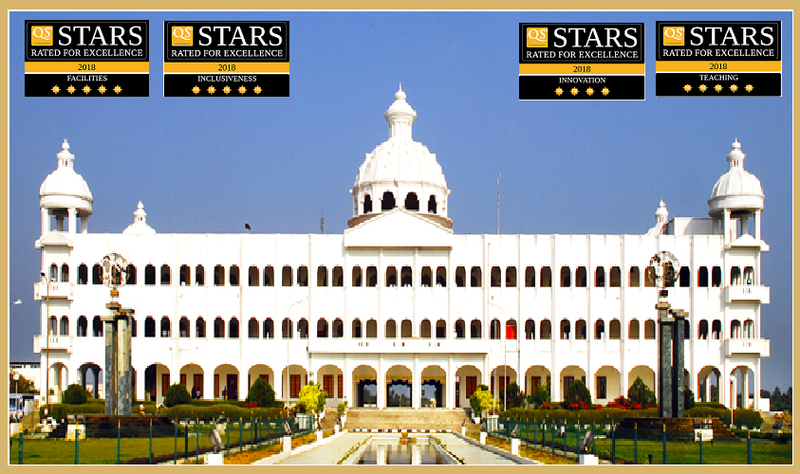 University also declared as one among the top 31 deemed to be Universities by the Times Higher Education Ranking.